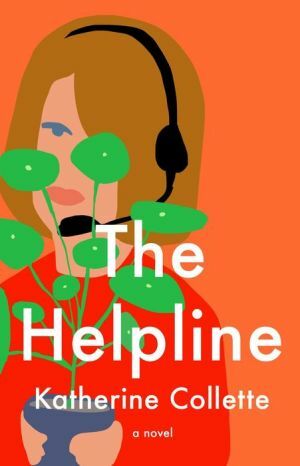 The Helpline is the first novel by Australian author, Katherine Collette. After four months of unemployment (it’s proving a challenge to keep busy all day), Germaine Johnson is somewhat relieved to take the job that her cousin Kimberley lined up with the Deepdene City Council. While, as a senior mathematician, she considers her position on the Senior Citizens Helpline as well below her qualifications, she’s already collecting data with a view to minimising inefficiencies and streamlining the process. Then Mayor Verity Bainbridge singles her out for a special project: Germaine is sent to the Senior Citizens Centre to settle an ongoing parking dispute with the nearby Fitzsimmons Golf Club. When she discovers just who the owner of the golf club is, she’s eager to resolve the issue, but it turns out not to be a simple matter to sort out. And perhaps some of the parties have hidden agendas? The complication in all of this is that Collette’s protagonist is great with numbers but less so with people. Germaine night be somewhere “on the spectrum”; she certainly has a touch of OCD; she’s often oblivious to social cues; she manages to rationalise poor decisions, allows her infatuation to cloud her judgement, and is sometimes incredibly naïve. But eventually, she does find out what’s truly important in life (and it’s not status, career, money or personal connections). What a wonderfully diverse support cast Collette gives Germaine: a cheating sudoku champion, a manipulative mayor, a grumpy club president, a CWA-prize-winning cook; an activist mother; a very smart six-year-old boy; a creative helpline operator; a manager with a conscience; a persistently friendly neighbour; and a casually clad IT expert. Collette includes plenty of laugh-out-loud humour, but also a few poignant moments. It should come as no surprise to readers that this excellent novel is published by Text Publishing: Germaine Johnson could easily be the cousin of Grace Lisa Vandenberg (Toni Jordan’s “Addition”) and Don Tillman (Graeme Simsion’s “Rosie” series), both also products of Text. Funny and heart-warming, this is a brilliant debut novel and Collette’s further works will be eagerly anticipated.